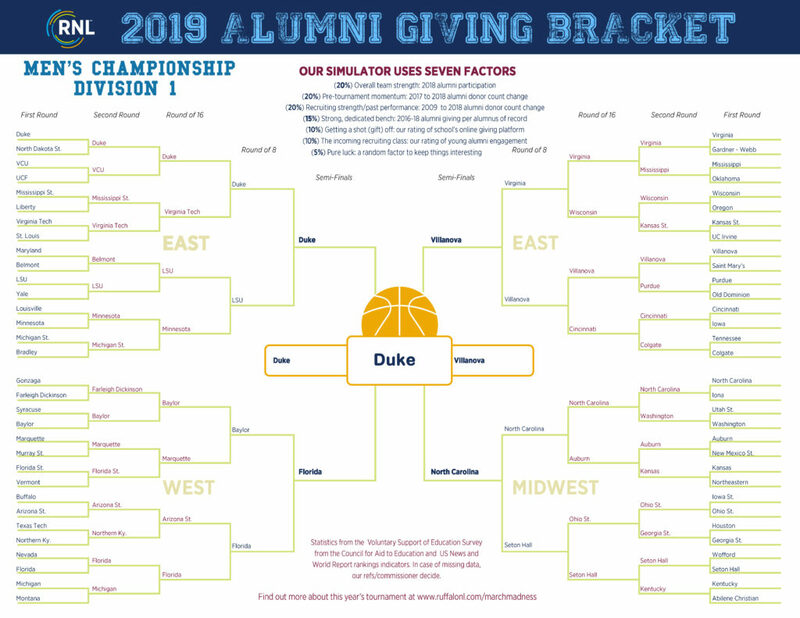 We have the winners of the 2019 RNL March (Alumni Giving) Madness , our annual alumni giving tournament among colleges and universities in the NCAA basketball tournament. Our seven-part methodology looks at key statistics like alumni participation, donor counts, changes over time, along with our “referees” judgments of online giving portals and young alumni engagement. Check out the full brackets here! Women’s Bracket: The University of Notre Dame. A return winner for our tournament, the Fighting Irish alumni donors continue their generosity (and growth in numbers!). Notre Dame continues to have consistent alumni participation, and excitement with the Boldly Notre Dame campaign. They are also just really great at showcasing mission, impact and purpose throughought their online presence. For top performers in our “tournament” this was important. Men’s Bracket: Duke University. Consistency was the name of the game for this year’s new tournament winner. A top performer on all six of our criteria, growing donors, solid participation, and very generous alumni. Key messages on the Duke giving site include “find your passion” and “see the impact.” These are key messaging areas for engaging 21st century donors. And I’m not going to lie, the fact that “Giving to Duke” appeared literally in the middle of my screen when I hit Duke.edu impressed me. Congrats on the win! All this year’s tournament participants are winners. As we approached the final bracket stages, we noticed some pretty incredible alumni giving and donor growth at the top institutions. All participants in this year’s tournaments should be congratulated, with than $4 billion given by alumni to these institutions in 2018. Check out all the results, with expanded commentary on the stats, in our March (Alumni Giving) Madness 2019 e-book. Download your copy here. Coaches Corner: How can my school “win” the alumni giving tournament? Balance donor acquisition, retention, engagement and ramp efforts. Some institutions had recent alumni donor gains. Some had long term growth. In most cases, the metrics were pretty mixed, with participation and donor counts up and down over time. The most stable institutions, however, did seem to post the best total dollars. Make giving easy. We know that online giving is growing at three times the rate of overall giving, so spend some time optimizing your portal to make it easy to give. Surprise and delight donors with your gratitude and engagement programs. Sure, you need to thank donors. But what are you doing to make giving “special?” With thousands of other charities competing for your alumni time, attention, and money, you need to make giving mean something. Start thinking out of the box. Offer young alumni exciting opportunities to get involved, and give to their passions. We know that alumni who volunteer are more likely to donate. 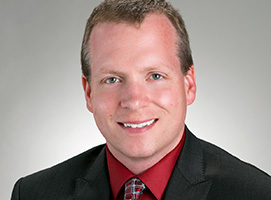 So, whether it’s traditional options like the reunion committee, or emerging opportunities like online mentorship and career connections or becoming a social media ambassador, you want to give alumni good options to get involved along with giving. (20%) Upward momentum going into the tournament: the increase or decline in alumni donor count per the VSE from 2017 to 2018. (20%) Recruiting strength and past tournament performance: The total increase or decline in alumni donors per the VSE between 2009 and 2018. (15%) A strong bench of dedicated team members: The total alumni giving in dollars divided by the alumni of record per the VSE over the last three fiscal years (2016-18). (10%) Getting a shot (gift) off: Our team of nine expert referees compare the two institutions’ online giving presence, including ease of online giving, giving day portal (if any), and crowdfunding. They grade how easy it was for an alumnus to “get a shot off” and make a gift. (10%) The incoming recruiting class: Our “designated millennials” compare the institutions’ young alumni engagement presence via web and mobile, including young alumni events, stewardship, value proposition for giving, social media, and young alumni giving features. *Non-reporters to the VSE are handled on a case by case basis, in some cases reverting to US News participation, and comparing similar stats wherever available. Non-reporting institutions operate a disadvantage in the tournament. These statistics and ratings are placed into a simulator, with each institution scoring between 1 and 64 points for each of the seven items. Weighting is applied, and a winner for each matchup determined from the final tournament ranking score. Read more about the methodology in the e-book and email me if you have suggestions or comments for the next tournament.